HOLIDAY SPOILER ALERT: Because this item normally ships in its original packaging, it may be visible to your gift recipients upon delivery! Add a gift message at checkout to let us know that you'd like it to ship inside an unmarked container. Disney Mickey Mouse Happy Hauler Ride On Who's the leader of the club. Come play along with your favorite clubhouse friend- Mickey Mouse with this innovatively designed combination 2-in-1 wagon /ride-on. In the ride-on mode, your little one rides in comfort as he holds the easy grip handles that play sounds and tunes at the touch of a button and they can tow along their favorite toys in the large under seat storage area. Great for indoor or outdoor play. Features: Innovative 2-in-1 wagon and ride-on combination Under seat storage or tow your favorite toys Custom handle transforms to become either pull handle or seat Includes sound effects and a tune at the touch of a button Ages 1-6 Years From the Manufacturer Who's the leader of the club. 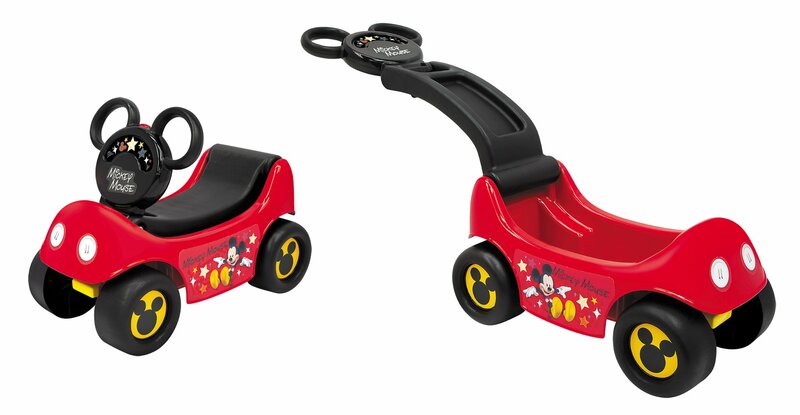 Come play along with your favorite clubhouse friend- Mickey Mouse with this innovatively designed combination 2-in-1 wagon /ride-on. In the ride-on mode, your little one rides in comfort as he holds the easy grip handles that play sounds and tunes at the touch of a button and they can tow along their favorite toys in the large under seat storage area. Great for indoor or outdoor play.